Reading and share top 10 famous quotes and sayings about Amulets by famous authors and people. Browse top 10 famous quotes and sayings about Amulets by most favorite authors. 1. "We can offer women what they want most of all, cures for the most common ailments of this world... When children are ailing or babies refuse to be born, when men are unfaithful, when the sky is empty of rain, when the amulets buried beneath holy wall upon instructions of the minim offer not solace and all entreaties to the priests for guidance fail, when the rituals they offer bring no comfort and no consolation, they come to us." 2. 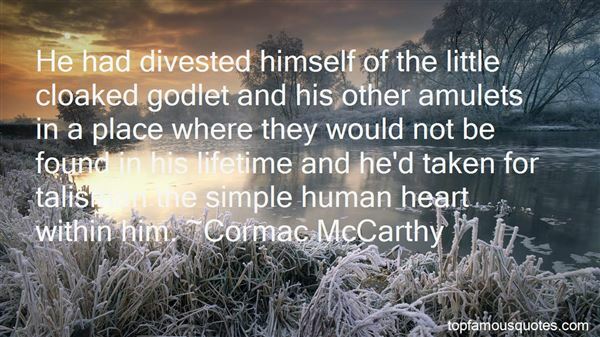 "He had divested himself of the little cloaked godlet and his other amulets in a place where they would not be found in his lifetime and he'd taken for talisman the simple human heart within him." 3. "He tip-toed past the double bed that had been placed in a corner - wrought-iron headboard, embroidered pillows, amulets against the evil-eye and a satiny, cobalt-blue bedspread. Blue was Iskender's favourite colour. It was the colour for boys, which meant the sky was a boy. So were the rivers and lakes. And the oceans, though he had yet to see one." 4. "Would you?" Mom smiles and touches my hair, pushing it back from my forehead. I let her, but I grit my teeth. Her bare fingers brush my skin. I am thankful when none of my amulets crack. "Do you know what the Turkish say about coffee? It should be black as hell, strong as death, and sweet as love. Isn't that beautiful? My grandfather told me that when I was a little girl, and I never forgot it. Unfortunately, I still like my milk." 5. "I believe I essentially remain what I have always been--a narrator, but one with extremely pressing personal needs. I want to introduce, I want to describe, I want to distribute mementos, amulets, I want to break out my wallet and pass around snapshots, I want to follow my nose. In this mood I don't dare go anywhere near the shortstory form. It eats up little fat undetatched writers like me." 6. "Lately I'd begun carrying pain amulets in my bag, like some people have breath mints." 7. "Yes, an actual full-sized camel. If you find that confusing, just think how the criosphinx must have felt.Where did the camel come from, you ask? I may have mentioned Walt's collection of amulets. Two of them summoned disgusting camels. I'dmet them before, so I was less than excited when a ton of dromedary flesh flew across my line of sight, plowed into the sphinx, and collapsed on topof it. The sphinx growled in outrage as it tried to free itself. The camel grunted and farted. "Hindenburg," I said. Only one camel could possibly fart that badly. "Walt, why in the world—?""Sorry!" he yelled. "Wrong amulet! "The technique worked, at any rate. The camel wasn't much of a fighter, but it was quite heavy and clumsy. The criosphinx snarled and clawedat the floor, trying unsuccessfully to push the camel off; but Hindenburg just splayed his legs, made alarmed honking sounds, and let loose gas.I moved to Walt's side and tried to get my bearings." 8. "Or powerful objects, such as statues, amulets, monuments, certain models of cars. But they preferhuman form. 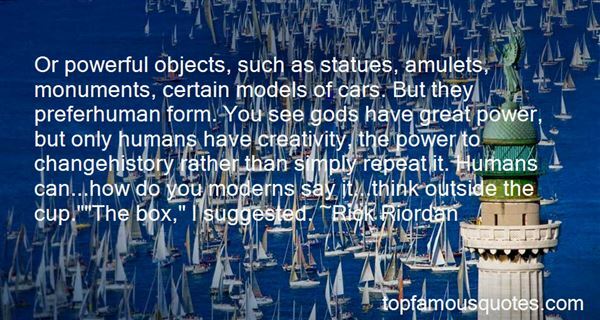 You see gods have great power, but only humans have creativity, the power to changehistory rather than simply repeat it. Humans can...how do you moderns say it...think outside the cup. ""The box," I suggested." 9. 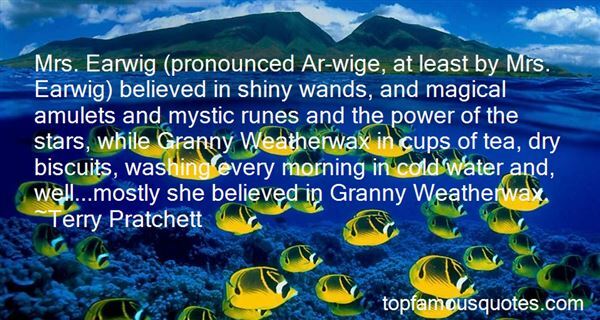 "Mrs. Earwig (pronounced Ar-wige, at least by Mrs. Earwig) believed in shiny wands, and magical amulets and mystic runes and the power of the stars, while Granny Weatherwax in cups of tea, dry biscuits, washing every morning in cold water and, well...mostly she believed in Granny Weatherwax." 10. "The quasi-peaceable gentleman of leisure, then, not only consumes of the staff of life beyond the minimum required for subsistence and physical efficiency, but his consumption also undergoes a specialisation as regards the quality of the goods consumed. He consumes freely and of the best, in food, drink, narcotics, shelter, services, ornaments, apparel, weapons and accoutrements, amusements, amulets, and idols or divinities." He never got a really proper look at them, but the situation told him it must be a swarming flock of vaginas that flew all around his head, biting him toothlessly on his ears and his cheeks and his neck."